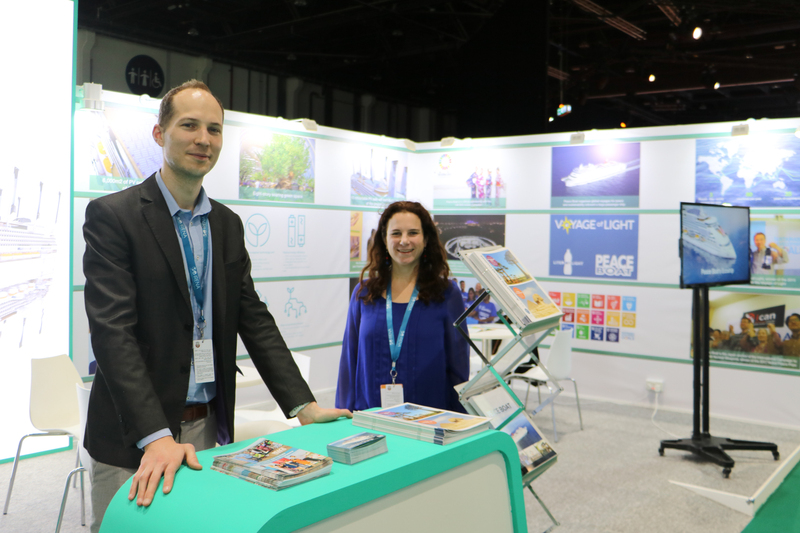 The Ecoship team started the year traveling to Abu Dhabi, UAE, to attend the Abu Dhabi Sustainability Week (ADSW), the largest sustainability gathering in the Middle East, held annually in January. 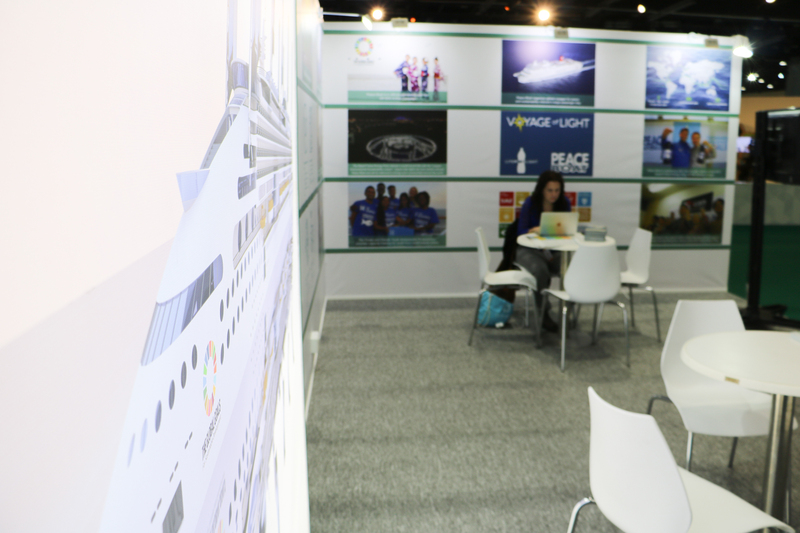 Peace Boat’s Ecoship promoted the latest news of the project with a booth in the Mobility area at the World Forum Energy Summit (WFES). Our ship design shared space with Tesla, the American automotive company specialized in electric car manufacturing, and the Academy of Technical Training, who exhibited an electric aircraft. During the week, Peace Boat introduced the project to the different attendees to the event, one of the world’s most influential sustainability platforms in the world. 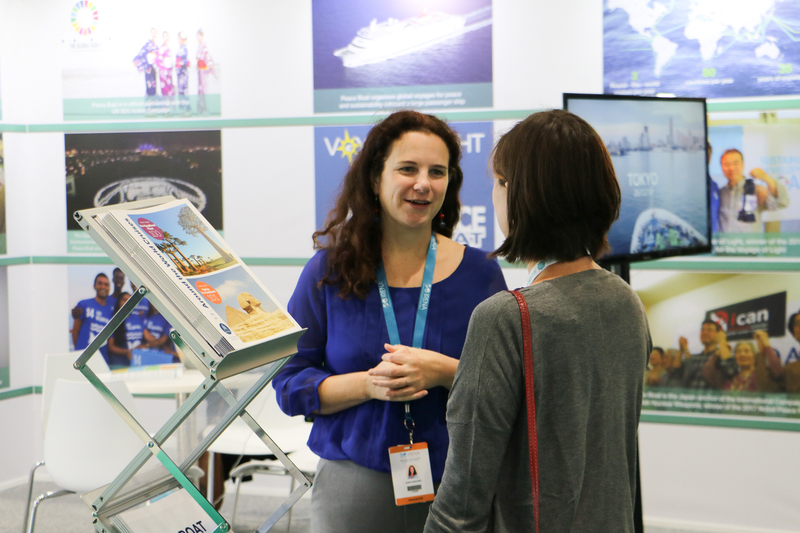 At the same time, the visitors to our booth learned about the latest Peace Boat’s initiatives, including the Voyage of Light. Marking the milestone of the 100th Global Voyage, Peace Boat is partnering with this Philippine-based organization in a new project to bring affordable lights around the world. The founder of the NGO, Illac Diaz, joined the 100th Peace Boat’s Global Voyage to carry out solar lighting systems workshops and deliver lights assembled on the ship by the voyage participants. The Voyage of Light started in Yokohama, Japan, on December 26th. During 100 days, it will cover a southern hemisphere route, docking in 19 ports around Asia, Africa, South America, and the Pacific. The ship will return to Japan on March 31 after circumnavigating the world. The ADSW is dedicated to furthering the understanding of the major social, economic and environmental trends shaping the world’s sustainable development, and to empowering the global community to realize viable and effective strategies to mitigate climate change and address the energy and sustainability challenges of the future. One of the main events of the week is the WFES. This event took place from 14-17 January at the Abu Dhabi National Exhibition Centre with five main pillars: The Future Summit, WFES Expo, WFES Forums, WFES Initiatives, and WFES Hosted Events. 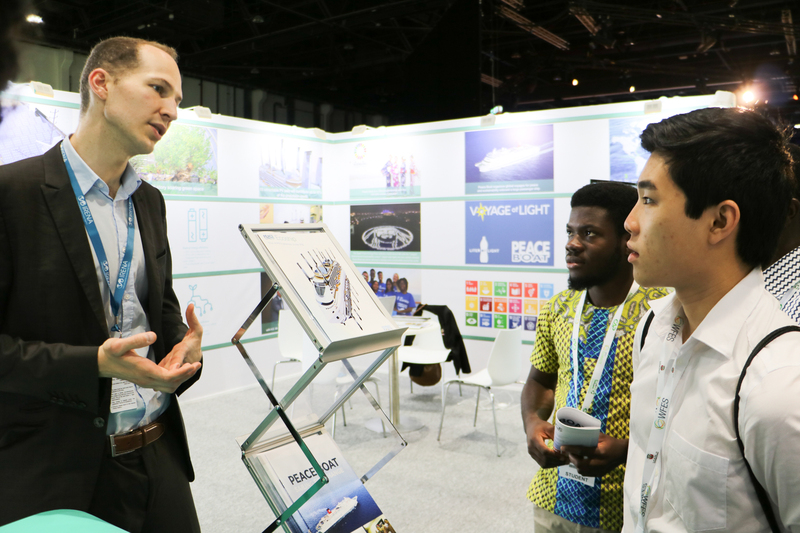 Now in its 12th year, the WFES Expo had 850 exhibitors from more than 40 countries showcasing the latest solutions in clean energy, solar, water, eco-waste, green buildings, and mobility. WFES 2019 convened more than 34,000 attendees in addition to 3,000 students from over 150 countries, including 15 heads of state, as well as more than 100 ministers and 3,000 participants from some of the world’s largest companies operating in the sustainability and renewables sectors.